This is an ‘introductory’ course and as such is aimed primarily at new Recreation professionals who need to (a) understand the basic principles of negligence and legal liability, and (b) know how to apply simple risk management planning skills to their job situation. For more seasoned professionals, the course provides a refesher on the legal principles surrounding negligence, and the benefits of a simple risk management planning process. The primary goal of this online course is to increase staff awareness in the area of Negligence, Legal Liability and Risk Management, and provide participants with the knowledge and skills needed to reduce the risk of participant injury – and the potential of negligence litigation. This course explores Negligence Liability and the Risk Management planning process. Students will learn the critical concept of Reasonable Standard of Care and how this impacts and guides all risk management planning efforts. By the end of the course, students will have a clear understanding of the concept of negligence as it applies to the area of sport and recreation, and will acquire valuable risk management planning tools and the skills necessary to develop and implement a simple risk management plan for their work situation. Develop a prioritized Risk Management Action Plan based on the risks identified in your audit. Course work and assignments should take approximately 3-5 hours per week. 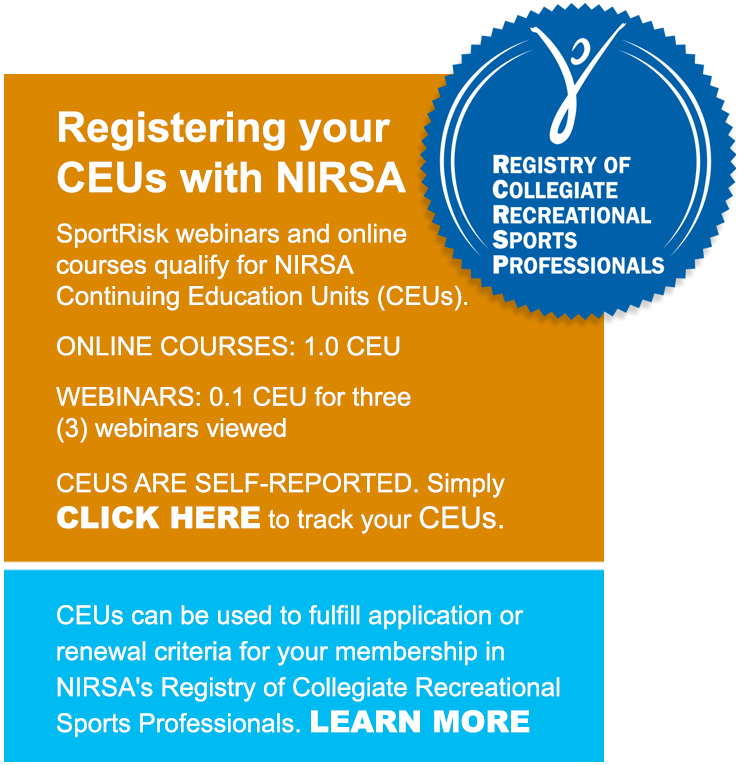 One (1) CEU credit available through the NIRSA Registry! To register: click on ‘Add to Cart’ and pay for course through PayPal. This will complete your registration. It’s great to work with expertise who really understand the critical issues of managing our inherent risk in recreation and student programming. As a professional who is committed to providing safe programming, it’s essential to know your problem areas and how your program measures up nationally. I want to do everything possible to identify weaknesses and build concrete action plans – and this assessment tool does both!